The Wachowskis and Tom Twyker Talk Creating "Cloud Atlas"
The visionary filmmakers discuss the long road in bringing their latest film to life. 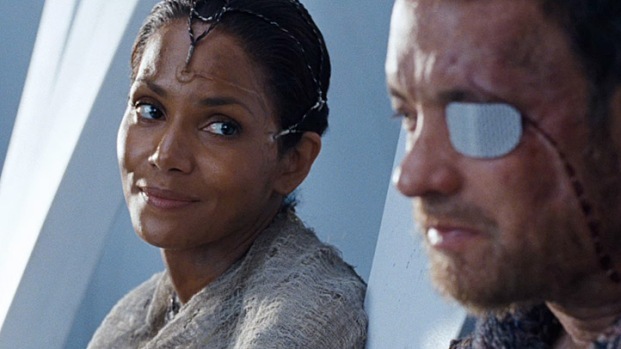 Tom Hanks and Halle Berry in "Cloud Atlas." Given that their time-spanning magnum opus “Cloud Atlas” was a Herculean labor of love four years in the making, filmmakers Andy and Lana Wachowski and their co-director Tom Tywker finally decided to tell as well as show. The Wachowskis, the writing/directing team behind “Bound,” “The Matrix” and “Speed Racer,” have long demurred when it comes to talking about their films, their process and their creative intentions. But after the lengths they went to get their ambitious vision for Dennis Mitchell’s bestselling sci-fi novel to the screen, this time adding Tywker – the German filmmaker behind the much-admired “Run Lola Run” and “Perfume” – as co-director, the trio are stepping out from behind their Oz-like curtain to talk about making what essentially became the most ambitious and expensive indie art film in history. Andy Wachowski: We don’t like talking about ourselves -- that is very uncomfortable. That part of the process is uncomfortable for me. Tom Hanks, Halle Berry, Jim Broadbent, Susan Sarandon and Hugh Grant star in this adaptation of the David Mitchell novel that follows the lives of six groups of people across the centuries to explore the interconnectedness of our lives. Directed by the Wachowski Siblings ("The Matrix") and Tom Tykwer ("Run Lola Run"). Lana Wachowski: During the first ‘Matrix,’ you feel like it was the beginning of the collapse of your way to inhabit the world. You have essentially anonymity that gives you access to a way to participate in civic space that, when you lose that anonymity, you can no longer participate in that mode of being – it’s denied to you. We were not willing to give that up. That was too big of a price. With Warner Bros. we sat down and they said ‘You have to do press.’ And we said, ‘Okay – we won’t make movies.’ Then they said, ‘Okay – maybe you don’t have to do press.’ [Laughs]. Then, in the course of things, we changed our minds. Andy Wachowski: We like to make our movie and have people talk about it. For me, you gotta write the movie. You gotta make the movie. You gotta edit the movie. And now I have to sit down and explain it to you? [Laughs] I think that movie audiences have gotten a little flabby in terms of their critical thinking. That’s one of the reasons we aren’t interested in talking about our films. But this one was special to us, a labor of love, and we didn’t want to let it go out there without talking about it a little bit. Tom Tykwer: I also think there is an audience that is like us. There is an audience that is undernourished and wants to be fed. They love to soak up and think and go to a dinner and have a full dinner just about what you’ve just seen and then take it to bed and wake up in the morning, still thinking about it. That’s how we fell in love with cinema. We cannot be alone because we meet those people all the time. 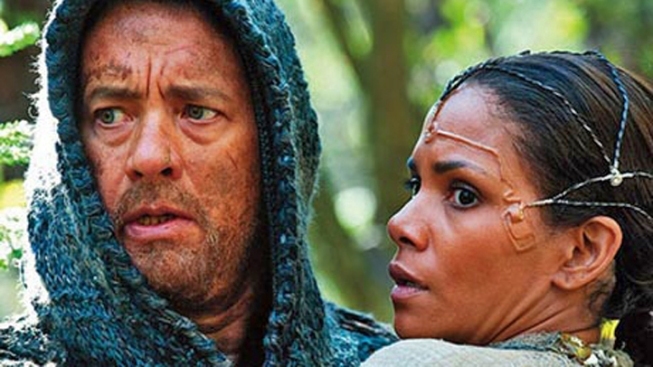 Tom Hanks discusses his complex new movie, "Cloud Atlas." Out of the many looks he had in the film, which was his favorite? He also dishes on taking photos with a "drunk" fan. Andy Wachowski: We worked on this for four years. We started the last Obama inauguration. Tom Tykwer: We went to all the studios and they all passed repeatedly. Lana Wachowski: With the cast in place! Tom Tykwer: They were just stressed by the idea of this movie. We had to go back to Warner Bros. several times until they at least stepped in for domestic [distribution] and we basically went to every continent and every country and we were passed over. France! France didn’t buy this movie. Andy Wachowski: They didn’t buy the movie twice. Went to Cannes with the cast and with us and the script, they said no. We went the next year with the movie! We showed the movie and they passed. The UK passed! Lana Wachowski: You try in the prep to basically to build a stage. All three of us think that actors are an underrated art form – we love working with actors. We had this astonishing cast that was capable of so much and we wanted to make sure that we were prepared enough to not be rushed. So we could let them explore and play and try a range and let them do some variations, that was the most important thing to us in the prep – that when we got to the day, we would have the time to let them play. Lana Wachowski: We actually think it’s interesting that the movie ended up reflecting our experience of making the movie. That was more profound than to think about past or future lives. There were ideas and challenges that were in the book that would suddenly materialize and be part of our lives. The movie suggests this idea that one person can come into your life and completely and utterly change the direction of your life. We love the idea that David Mitchell, like [the book’s] Adam Ewing, on his boat off windswept island somewhere scribbling this novel. And this novel goes out into the world and Natalie Portman is reading it, and then I see it and grab it, then I give it to Andy and then he gives it to Tom. Andy Wachowski: Like in the book, Adam Ewing goes to Robert Frobisher and Frobisher writes this letters and those go to Louisa Ray – the book landed in our laps in similar fashion. "Cloud Atlas" opens Oct. 26.